Most online communities are small —Our research is inspired by the skewed distribution of attention online. 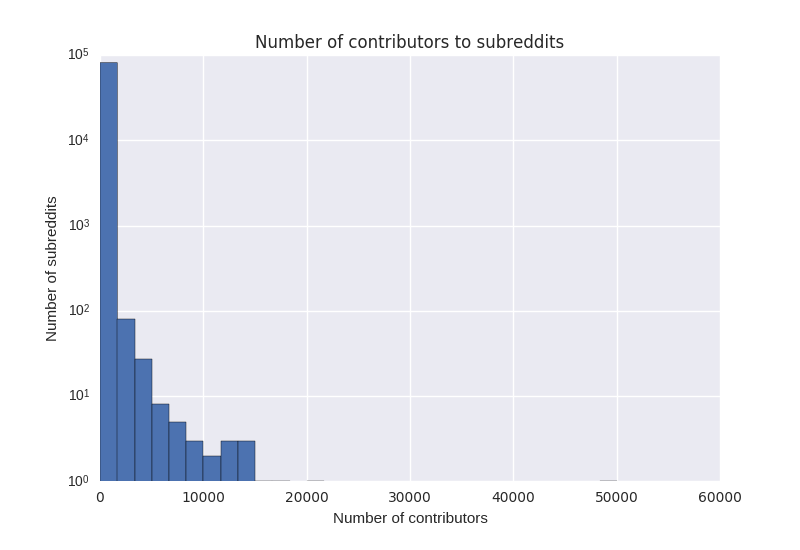 For example, these three graphs show the number of contributors to each subreddit, github project, and Wikipedia page. 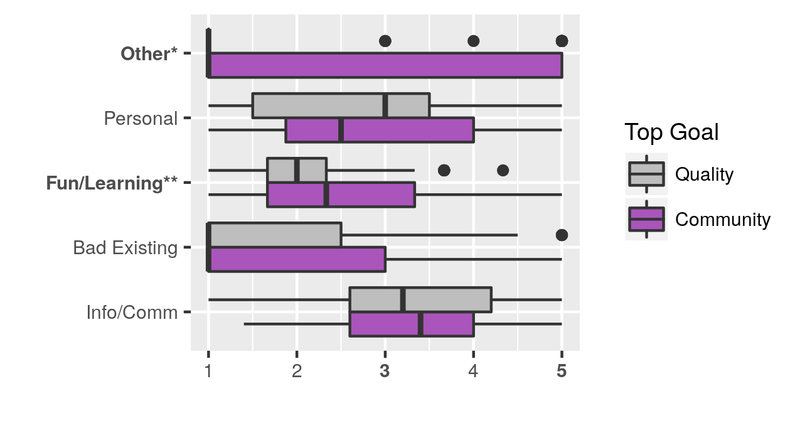 (Note the log scale – the reality is even more skewed than these plots make it appear). Our Survey —We worked with some great folks at Wikia to send a survey to community founders right after they started their community. We received partial or full responses from hundreds of founders. Founders have diverse motivations and modest goals — We found that Wikia founders have diverse motivations. We used PCA to identify four main motivations for creating new wikis: spreading information and building a community, problems with existing wikis, for fun or learning, and creating and publicizing personal content. Spreading information and building a community was the most common motivation, but each of these was marked as a primary motivation by multiple respondents. We also found that the barriers to starting a new community – both technological and cognitive – are very low. Only 32% of founders reported planning on starting their wiki for a few weeks or longer, while fully 46% of founders had only planned it for a few hours or a few minutes. Distribution of founder motivations and plans, based on whether their top goal is community or information quality. So what? —We believe that platform designers and researchers should focus more of their resources on understanding small and short-lived communities. Our research suggests that the attention paid to the more popular and long-lived online communities has perpetuated a false assumption that all communities seek to become large and powerful. Indeed, our respondents are typically not seeking or even hoping for large-scale “success”. 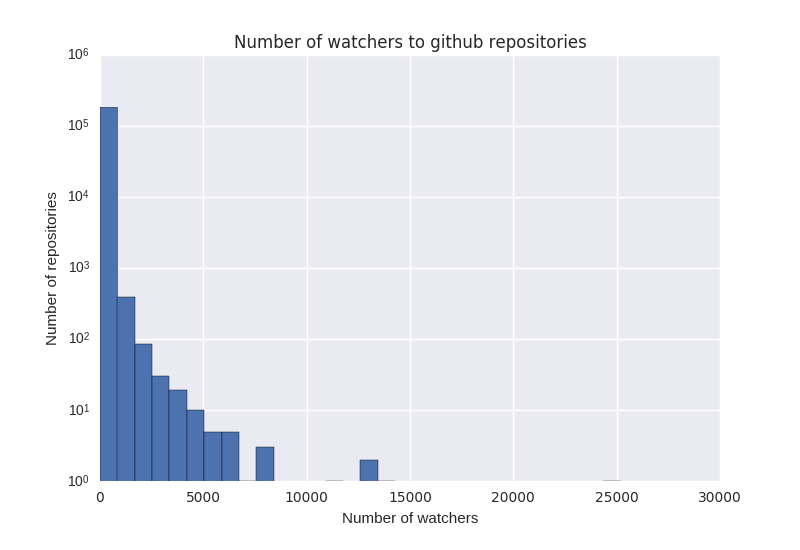 There is also a need to generalize this research – founders on other online platforms (Reddit, github, etc.) may have a different set of motivations and goals (although we suspect that they will be similarly modest in their ambitions). 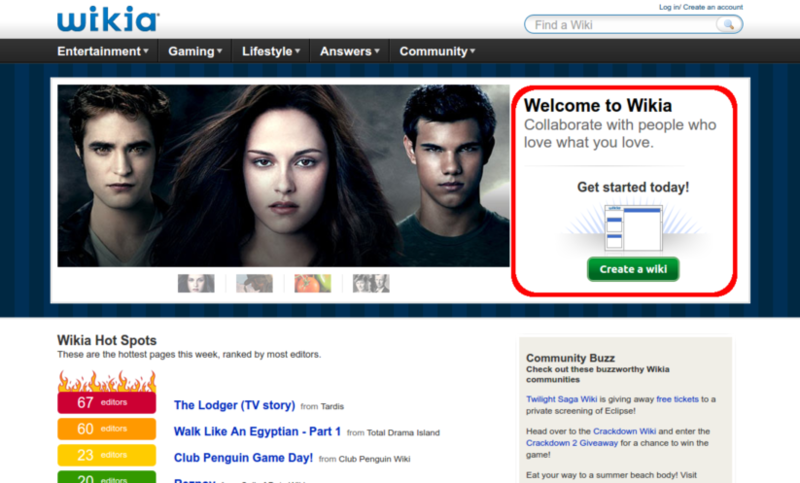 Overall, there is lots of room for additional research on how and why things get started online. 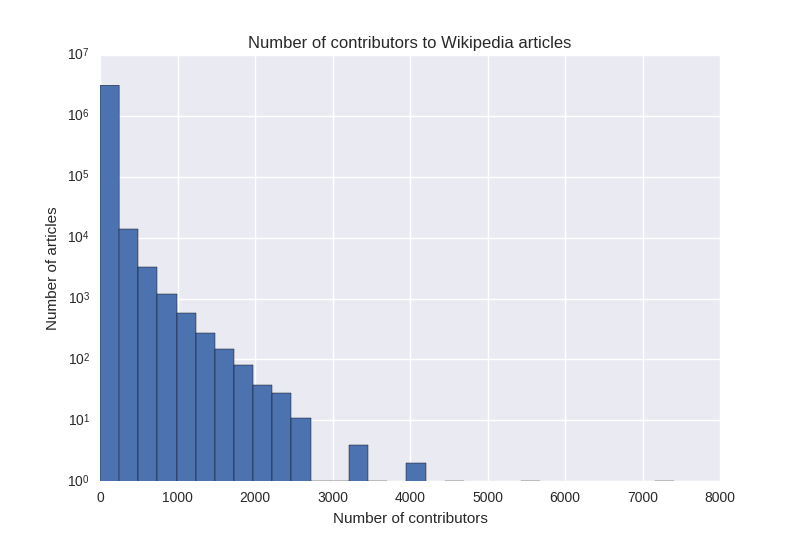 The paper and data — If you liked this blog post, then you’ll love the full paper: Starting online communities: Motivations and goals of wiki founders. Even better, if you are planning to be at CHI 2017, come watch the talk! This post (and the paper) were written by Jeremy Foote, Aaron Shaw and Darren Gergle. The charts at the beginning of the post were created using data from the great public datasets at Big Query. 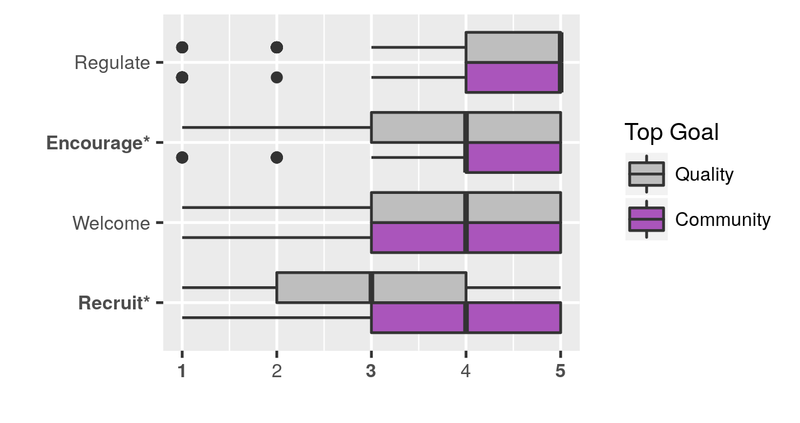 Anonymized results of the survey are publicly available, and code is coming. I like this question, and I think it would be interesting to ask it in the context of guild creation in MMORPGs, which are basically small communities (10 – 50 members) that pop up to achieve in game goals. At the launch of WoW’s latest expansion, Legion, I partnered up with some local friends to coordinate and implement a highly organized “raid guild” as an experiment to test out the existing theories on creating online communities, recruiting newcomers, and motivating members to contribute over weeks at a time. There was a ton of work involved, from web-design to spreadsheet management to daily recruiting–but after a couple months, the community dissolved once its primary goals were satisfied (which were beating certain difficulties of the game with the group of people we accumulated).